Towns and villages across Bucks should look “smarter and tidier” in the coming months after the county council agreed to spend an additional £500,000 on clearing weeds. Bucks County Council’s cabinet met yesterday morning (Monday) to discuss the authority’s last ever budget before the transition to a unitary council in April 2020. Cabinet member for transport Mark Shaw announced an additional half a million of funding has been allotted to rid town centres and villages of unwanted overgrown greenery in the forthcoming financial year. Cllr Shaw said: “The leader and I met with Transport for Bucks a couple of weeks ago, and in discussions with them we have been able to find an additional half a million as a one-off for this coming year, which will allow us to spray three times the most populated areas where weeds grow on the roads. Cllr Shaw added the possibility of a weed clean-up had been discussed over the past four to five months and that they had been looking at finding a way of spending heavily on this issue. 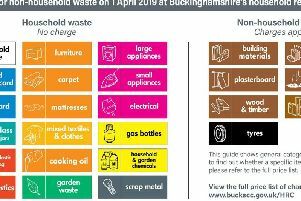 Leader of Bucks County Council Martin Tett says the council “owes it to residents” to “clear up the county” – but reminded members it is busier towns and villages that will be focused on, rather than rural roads. “What I am trying to do is, within our resources, free up some money for a pretty thorough blitz of the weeds across the county. During the meeting members discussed a report by the county council's budget scrutiny committee, which outlined ten proposals, including setting aside cash to assess the condition of street lighting across the county.